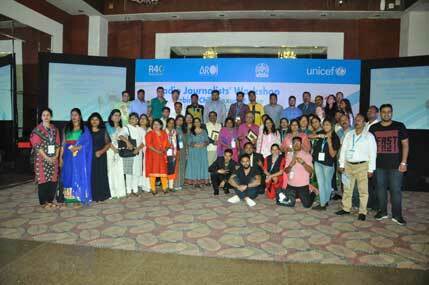 Chhaatisgargh, Haryana, Jharkhand, New Delhi, Odisha, West Bengal,and Uttar Pradesh came together in a three-day regional workshop focusing on public health and child sexual abuse, cocreating on-air programmes for prevention of violence against children. to child sexual abuse. The exercise is part of UNICEF India’s initiative for the annual Radio4child Awards in partnership with AROI and All India Radio, to recognize radio journalists who have contributed towards increasing awareness on issues related to immunization and child sexual abuse. abuse is possible and is everybody’s responsibility. The Odisha Police in collaboration with UNICEF recently activated statewide awareness campaign against Child Sexual Abuse tilted ‘Paree Pain Katha Tiye’ (A word for the little angel). Police treated all cases of Child Sexual Abuse as red flags and gave it the highest priority. suggested that local NGOs, district child protection units as well as the toll free CHILDLINE helpline number 1098 could be approached for support in reporting against child sexual abuse. protect the rights of children. how the prevention is the most effective strategy to address child sexual abuse. Participants were provided a holistic overview of the POCSO Act that deals with cases of child sexual abuse.